Milepost 1336: Conway, Texas, virtual ghost town. Kaye and I have been traveling on our road to adventure through the American southwest the last couple of days, from Oklahoma west through the Texas panhandle and into New Mexico. 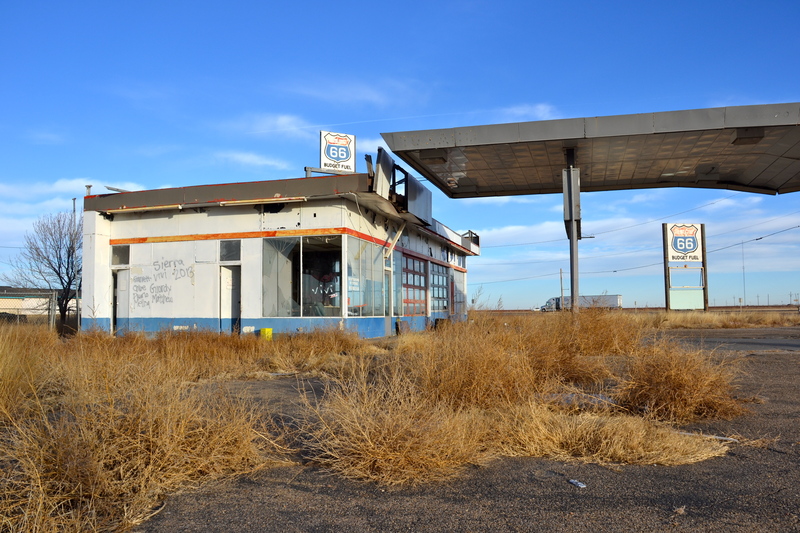 We keep seeing relics left behind by earlier travelers, as we are roughly tracing the abandoned path of the famous Route 66, the two-lane blacktop highway that connected Chicago to California before the modern era of the interstate expressway. Mind you, we are traveling on the freeway, not the two-lane, because ours is not a leisurely venture this time through; we have someplace we need to be by the end of next week. But every time we get off the super-slab we see the ghosts of those former adventurers and the gutsy entrepreneurs who built the roadside tourist stops. 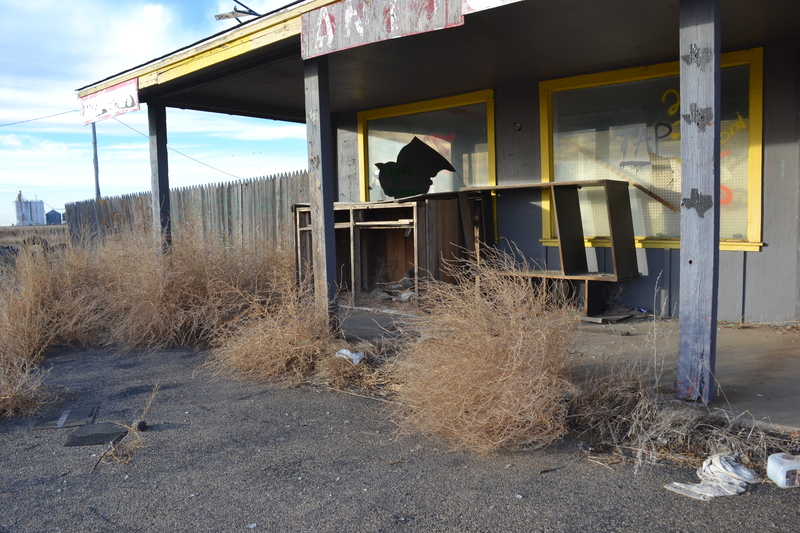 There are deserted houses and businesses everywhere, often within sight of the new travel plazas. The abandoned Phillips 66 filling station, Conway, Texas. Last night we drove till after sunset and ended up getting off at the wrong exit while searching for a hotel. We ended up checking in at a dubious outfit on a deserted blacktop running parallel to the freeway, a run-down motel with tumbleweeds lined up against the chain-link fence around the used-to-be-a-swimming-pool. I was heartened to see several other cars parked in front of rooms. 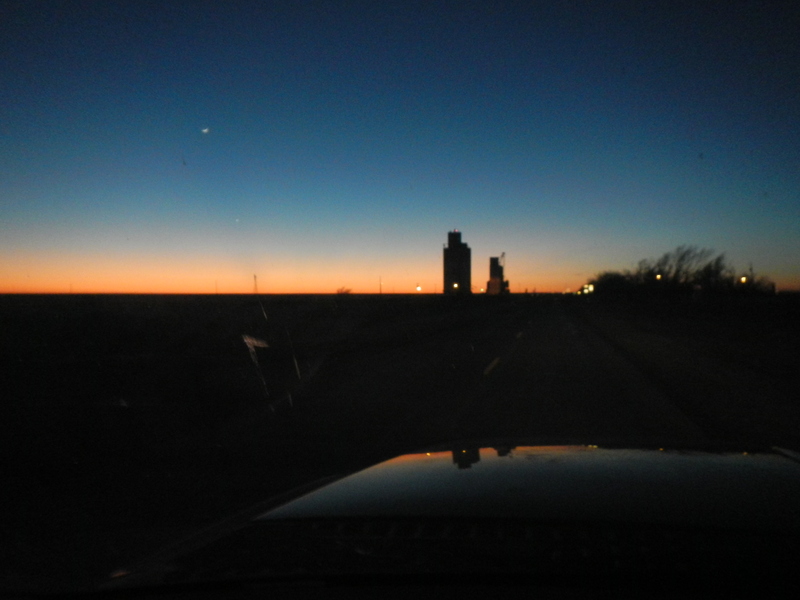 Conway, Texas, a near ghost town, as we approached it at twilight. The proprietor, Arwin, was reassuring enough and told us where to park the rig and said it would be safe because he hadn’t had any trouble in 30 years. We went to bed and were warm and comfy all night. Morning dawned, and having slept in, we reported late for the free breakfast, walking across the parking lot where we noticed that the other cars were all still there… and they all had flat tires. Yes, they were dummy cars, clever props parked there a long time ago to make the place look busy. The only vehicles that had moved were the two semis that I had parked our rig next to, and they had left early. 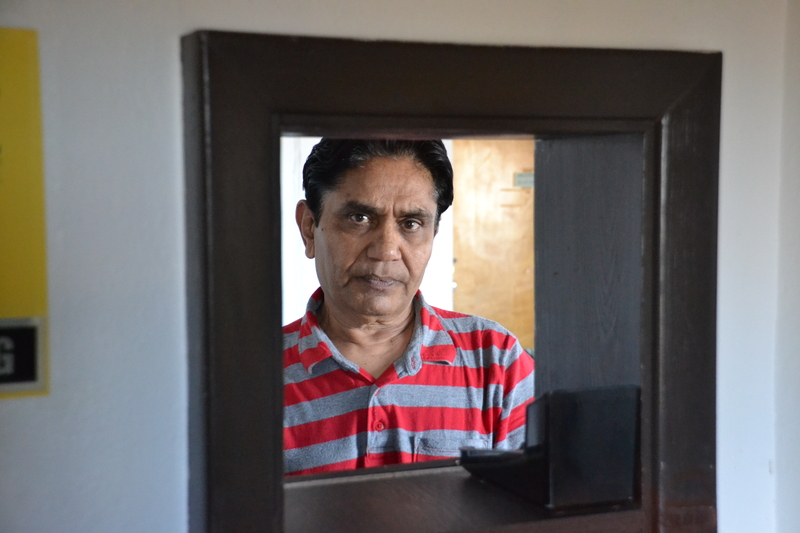 Arwin Patel, proprietor of the Conway Inn at the forgotten town of Conway, Texas. My respect for Arwin might have taken a hit, but I starting thinking about what I would have done to stay alive if I owned a once-beautiful establishment that 60 years ago had been frequented by the intrepid wanderers on the the once-famous Route 66. An aging motel that was now bypassed by the super highway. 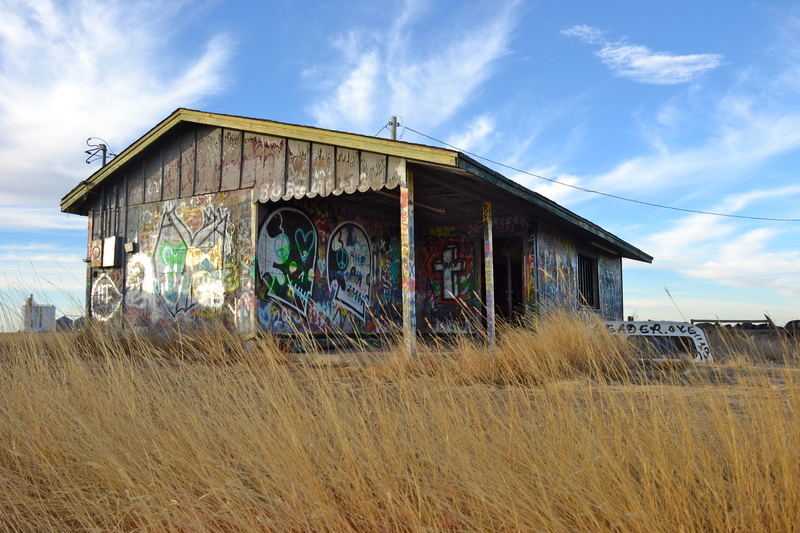 I saw the abandoned gas station and restaurant next door and eagerly grabbed my camera for the now rare photo shoot. I’ve been stuck to the highway for 1,336 miles now and haven’t had the luxury of time for anything aesthetic. 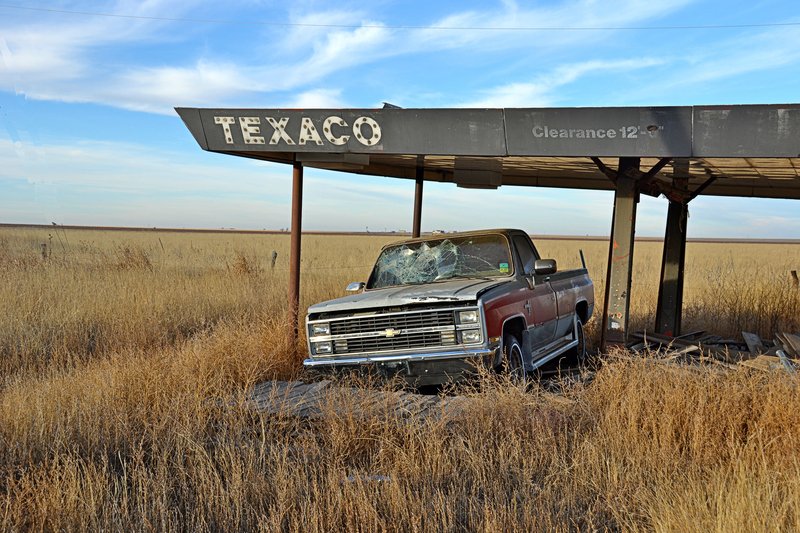 There is a lot of decaying beauty here on this deserted prairie. Five VW’s sticking out of the ground. 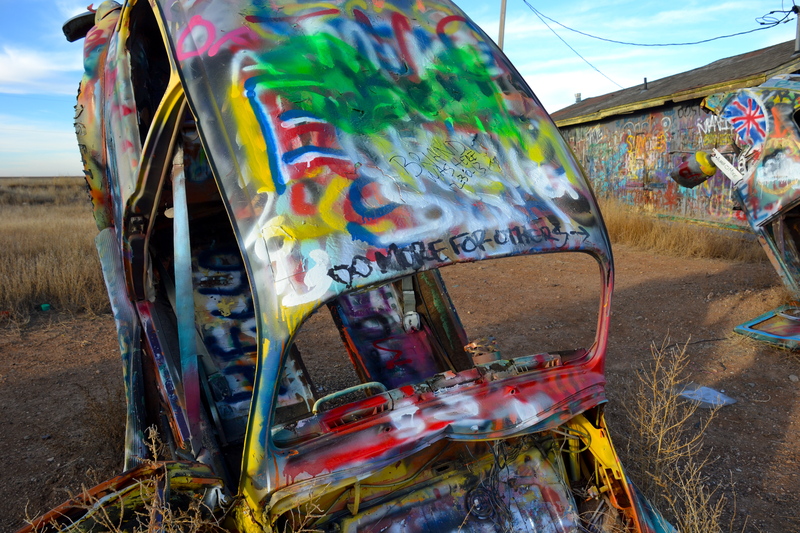 Tourist attractions along Route 66 were zany and imaginative. 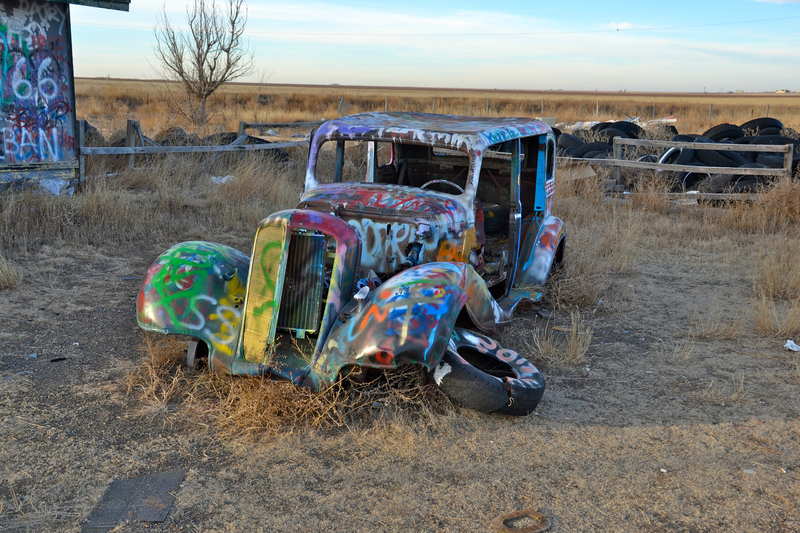 A typical scene along the famous old Route 66. Kaye waves from the truck at a rest area in the Texas panhandle. 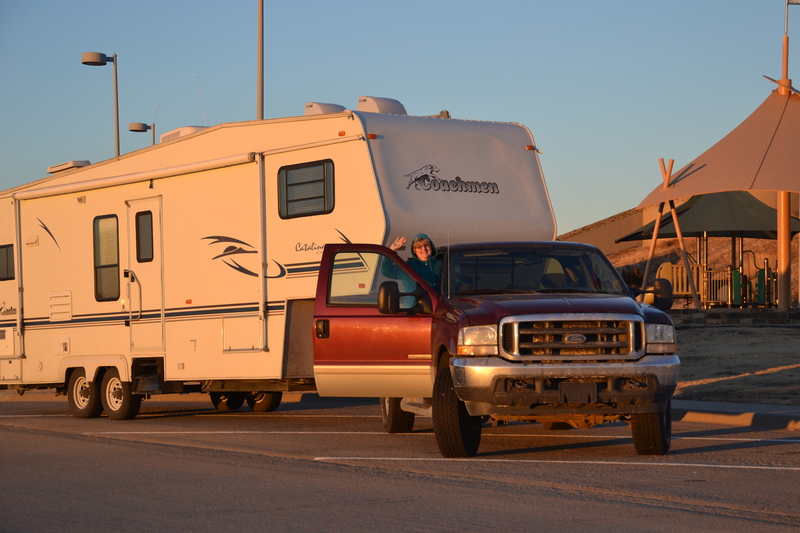 We have made it to Amarillo, Texas, and we’re liking the idea that we are half way to our winter haven in California. 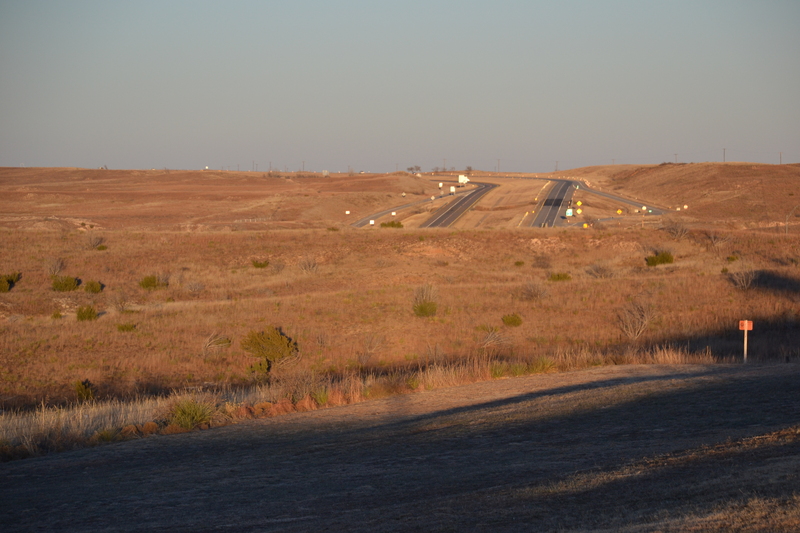 But the other side was the bleak prairie of Oklahoma. It was desolate and creepy, and I’ll have to admit, it spooked us. We stayed at a lonely outpost called Big Cabin last night, but there didn’t seem to be a town. Just a solitary Super 8 hotel with nobody around but the girl behind the desk in the lobby. It could have been haunted. Wide open spaces full of… nothing heading across the Texas prairie. And then today we drove all day to transverse the length of dreary Oklahoma, making it into Texas before sundown. And again, the desolate and massive panorama left us dispirited, and the chilly wind off the plains whispered discouraging words over our shoulders as we scuttled to the cheap motel room while the tentative new crescent moon rose hesitantly over our temporary home on the range. So, while we have escaped the violent winter that’s pouncing upon our friends back home in Michigan – there’s no snow here at all, and the ponds and rivers haven’t the least bit of ice on them – we are still not resting easily, disquieted by the uneasy spirit of the wide open and unfriendly spaces. Here’s an unusual bit of travel trivia that we encountered today while on the open freeway: The semi that had just passed us weaved a bit as it pulled back in ahead of us as if dodging a stray animal. 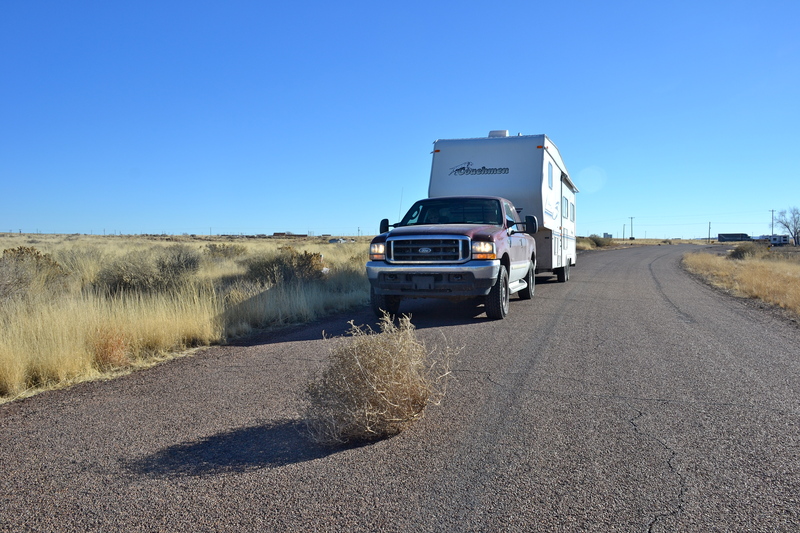 But what emerged was a large tumbleweed, 3 feet in diameter and rolling across the highway. Strange. Tumble weeds somersault across the roads on every windy day. 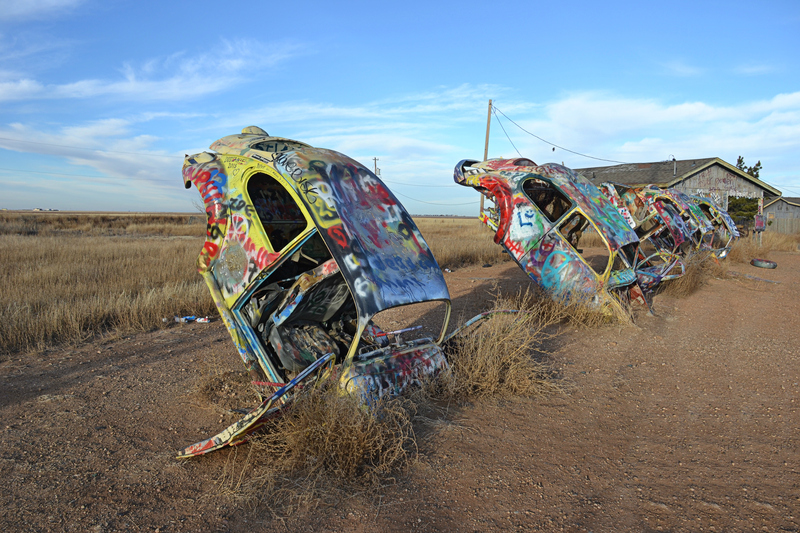 Tomorrow we hope to make it across the Texas panhandle and into New Mexico. And we are planning on quitting early, putting in a shorter travel day to spend more time relaxing. Maybe we will find it warm enough to finally unfurl the RV and stay in our own abode for the night. We need some down time to gather our wits about us.